MSR Titan 2 Pot Set nests together in one lightweight, compact package. When you need to carry multiple pots but don't want to carry extra weight, the Titan 2 is the perfect solution for melting snow and boil-only meals. 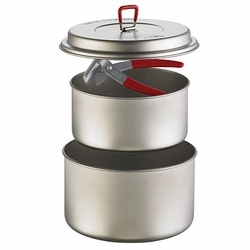 Includes: (1) 1L titanium pot, (1) 1.5L titanium pot, (1) titanium lid/plate, (1) LiteLifter™ pot handle.